Home » Blogs and Links » What is going on with your Christmas tree? According to a report in the Independent last week, millennials are increasingly opting for non-traditional Christmas decorations – choosing to decorate their trees with unicorns, mermaids, prosecco bottles and dogs rather than stars, angels, fairies, tinsel, Santa Claus and reindeer. It’s about this time of year that I become infamous again for telling people that Father Christmas and the tooth fairy don’t exist. Personally, I would rather not confuse my children with myths and fables when we are trying to talk about a much more exciting real-life story, but I realise this is a minority view even amongst Christians. So, all in all, I can’t really get all that worked up about whether we have Santa, Darth Vader or Princess Elsa on our Christmas tree. But I guess the way the next generation are decorating theirs is another sign of the ongoing process of decoupling Christmas from the celebration of the birth of Jesus. This season is one of those puzzling opportunities for Christians: Shall we fully embrace it as part of our culture which we can use for some gospel profit? Or should we avoid it completely as something almost blasphemous? There are, even in the seemingly unchristian parts of Christmas, things that are good that we can be thankful for, and it is a time when many people will make their one visit of the year to our churches. And for some who do come it has been the start of their journey to faith. However you decide that you are going to celebrate Christmas, I want to encourage you to be godly about it. 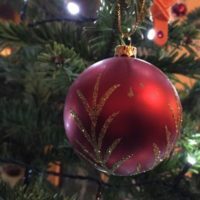 Don’t make Christmas a time when you abandon normal Christian behaviour as though God is giving you a day off; drunkenness, selfishness and greed – the idolatry of good food, possessions or experience – can spoil your witness and relationships. Also, be clear in your own mind and explain to your friends and family what is true and what is myth; stick with the historical accounts in the Gospels. And if you are going to do the Father Christmas thing, do it in a way that your kids know deep down that this is a just a game. Now off you go and buy your tree! Couldn’t disagree more about Father Christmas – as you say you are in the minority even amongst Christians Graham! We will continue to ‘believe’ in the magic and allow our children the wonder of the experience as children should be able to. Of course we can have different views on this topic and can disagree, but would want us to do it in a God-honouring way. With children they are learning fiction and doing imaginary play all the time so some can argue that Father Christmas is in that category and I respect that, but others like myself think it’s confusing when blurring it with such a major Christian doctrine… but i am not imposing this view on others. I tend not to make a thing of this in public meetings in order not to create a distraction that spoils the gospel opportunity. It never occurred to me to think that the truth/reality of Santa and Jesus in any way correlated. As I read this I am really struck by the question of how we witness and honour God over the festive season, and in particular on Christmas Day. ‘Don’t make Christmas a time to abandon normal Christian behaviour‘ is a wonderful statement and although true of every day (not just Christmas) it does seem more likely that we may do this under the guise of celebrating Jesus. Thank you for providing something to reflect upon, chew over and perhaps change our actions as a result.